Thrive DC works to prevent and end homelessness in Washington, DC by providing vulnerable people with a wide range of services to help stabilize their lives. Founded in 1979 to serve dinner to homeless women, Thrive DC has grown to be a comprehensive, professionally staffed, bilingual organization serving more than 2,000 men, women, and children each year. We are a safety net for people experiencing homelessness, unemployment, housing instability, and food insecurity. With our help, our clients take the first steps toward independence and self-sufficiency. Thrive DC began in 1979 as the Dinner Program for Homeless Women (DPHW), a grassroots response to the first major wave of homelessness on the streets of downtown Washington, DC. 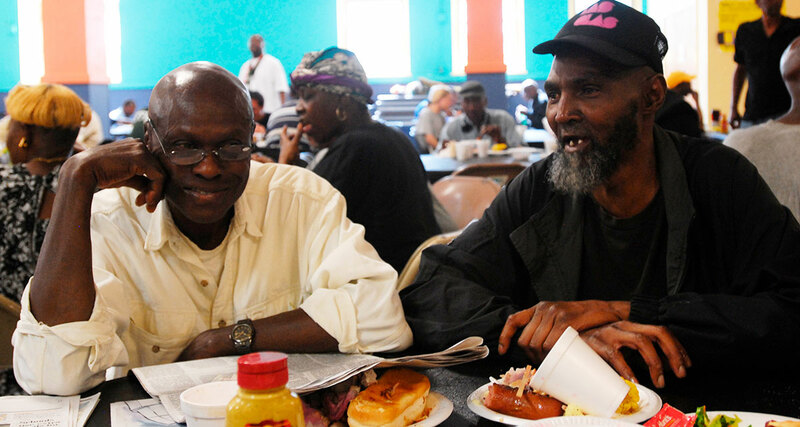 In 1998 we began serving breakfast to homeless men, as well as women, and founded our job training program. In 2007 we introduced formal case management and educational programming. As Thrive DC continued to change, we moved in 2008 from downtown Washington, DC to the Columbia Heights neighborhood. With the big move, we also changed our name from DPHW to Thrive DC in order to better reflect our growing mission. From 2008 – 2014 three other homeless services programs closed around us. Coupled with the metoric rise of homelessness in in the District, Thrive DC is now the sole provider of homeless services for Ward One and much of the surrounding area. Currently we serve over 250 people a day and over 153,000 meals a year. With such a big need we need a big response. Support Thrive DC with a monthly gift to help sustain and grow these programs for our most vulnerable neighbors.